Endarterectomy is an operation to remove or bypass the fatty deposits, or blockage, in an artery narrowed by the buildup of fatty tissue (atherosclerosis). Removing the fatty deposits restores normal blood flow to the part of the body supplied by the artery. An endarterectomy is performed to treat cerebrovascular disease in which there is a serious reduction of blood supply to the brain (carotid endarterectomy), or to treat peripheral vascular disease (impaired blood supply to the legs). Endarterectomy is most often performed on one of the two main arteries in the neck (the carotids) opening the narrowed arteries leading to the brain. When performed by an experienced surgeon, the practice is extremely effective, reducing the risk of stroke by up to 70%. Recent studies indicate it is effective in preventing stroke, even among those patients who had no warning signs except narrowed arteries detected by their doctors on a routine exam. Before the surgery, a full medical exam is usually done to assess any specific health problems, such as diabetes, high blood pressure, heart disease, or stroke. If possible, reversible health problems, such as cigarette smoking or being overweight, should be corrected. Removing this fatty buildup, or bypassing a blocked segment, may restore blood flow to the brain, eliminate or decrease the symptoms, and lessen the risk of a stroke. When the blood vessels in the legs (and sometimes the arms) become narrowed, this can restrict blood flow and cause pain in the affected area. In severe cases, the tissue may die, requiring amputation. The narrowing is usually caused by buildup of fatty plaques in the vessels, often as the result of smoking, high blood pressure, or poorly-controlled diabetes mellitus. The vessels usually narrow slowly, but it's possible for a blood clot to form quickly, causing sudden severe pain in the affected leg or arm. Endarterectomy is a delicate operation that may require several hours. The surgeon begins by making an incision over the blocked artery and inserting a tube above and below the blockage to redirect the blood flow while the artery is opened. Next, the surgeon removes the fat and cholesterol buildup, along with any blood clots that have formed, with a blunt dissecting instrument. Then the surgeon bathes the clean wall in salt solution combined with heparin, an anticoagulant. Then the surgeon stitches the artery just enough so that the bypass shunt tube can be removed, and then he/she stitches the artery completely closed. After checking to make sure no blood is leaking, the surgeon next closes the skin incision with stitches. The operation should improve symptoms, although its long-term effects may be more limited, since arterial narrowing is rarely confined to one area of one artery. If narrowing is a problem throughout the body, arterial reconstructive surgery may be required. The total cost of an endarterectomy, including diagnostic tests, surgery, hospitalization, and follow-up care, will vary according to hospital, doctor, and area of the country where the operation is performed, but a patient can expect to pay in the range of $15,000. Patients who are very young, very old, or very ill, or who need more extensive surgery, may require more expensive treatment. Before surgery, the doctor pinpoints the location of the narrowed artery with an x-ray procedure called angiography. For surgery to be effective, the degree of narrowing should be at least 70%, but it should not be total. Patients undergoing angiography are given a local anesthetic, but the endarterectomy itself requires the use of a general anesthesia. After the surgery, the patient spends the first two days lying flat in bed. Patients who have had carotid endarterectomy should not bend the neck sharply during this time. Because the blood flow to the brain is now greatly increased, patients may experience a brief but severe headache, or lightheadedness. There may be a slight loss of sensation in the skin, or maybe a droop in the mouth, if any of the nerves in the neck were lightly bruised during surgery. In time, this should correct itself. Plaque is removed from the carotid artery by clamping the artery, cutting the plaque out, and closing the opening back up. The results after successful surgery are usually striking. The newly opened artery should help to restore normal blood flow. In carotid endarterectomy, surgery should prevent the risk of brain damage and stroke. However, the buildup of fat and cholesterol usually affects all arteries, not just the one that was operated on. Affected arteries in other parts of the body may be equally clogged and potentially dangerous. Even arteries that were operated electively will likely begin to clog up again after the surgery. For this reason, lifestyle changes (no smoking, low fat, low cholesterol diet) are important, especially if diet and lifestyle contributed to the development of the problem in the first place. 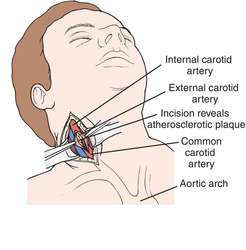 Carotid arteries — The four principal arteries of the neck and head. There are two common carotid arteries, each of which divides into the two main branches (internal and external). Diabetes mellitus — A disorder in which the pancreas doesn't produce enough (or any) insulin. As a result, the blood levels of sugar become very high. Among other things, diabetes can lead to the breakdown of small blood vessels and a high risk of atherosclerosis and high blood pressure. Stroke — Damage to the part of the brain caused by an interruption of the blood supply. In some cases, small pieces of plaque in the carotid artery may break loose and block an artery in the brain. A narrowed carotid artery also can be the source of blood clots travelling to the brain, or the artery can become completely clogged, blocking all blood flow to the brain. "Better Blood Flow: Surgery May Strike Down Stroke Risk." Prevention 47 (February 1, 1995): 50-52. National Institute of Neurological Disorders and Stroke. PO Box 5801, Bethesda, MD 20824. (800) 352-9424. http://www.ninds.nih.gov/index.htm. National Institute of Neurological Disorders at the Neurology Institute. PO Box 5801, Bethesda, MD 20824.
excision of thickened atheromatous areas of the innermost coat of an artery; see also atherectomy. carotid endarterectomy see carotid endarterectomy. Excision of atheromatous deposits, along with the diseased endothelium and media or most of the media of an artery, so as to leave a smooth lining, mostly consisting of adventitia. /end·ar·ter·ec·to·my/ (end-ahr″ter-ek´tah-me) excision of thickened atheromatous areas of the innermost coat of an artery. Surgical excision of the inner lining of an artery that is clogged with atherosclerotic buildup. the surgical removal of the intimal lining of an artery. The procedure is done to clear a major artery that may be blocked by plaque accumulation. Kinds of endarterectomy include disobliterative endarterectomy and gas endarterectomy. Cardiology The removal of atherosclerotic plaques from the intima of an artery. See Atherosclerosis, Carotid endarterectomy. Excision of diseased endothelium and media or most of the media of an artery, and also of occluding atheromatous deposits, so as to leave a smooth lining, mostly consisting of adventitia. An operation to restore full blood flow in an artery narrowed or blocked by ATHEROSCLEROSIS, by removing the diseased inner lining and any associated blood clot (thrombus). The affected segment of the artery is clamped during the operation. excision of thickened atheromatous areas of the innermost coat of an artery. endarterectomy within an extracranial carotid artery, usually within the common carotid. See also carotid endarterectomy.